Over the past year, there’s one fly rod company about which I keep hearing over and over: Syndicate. Competitive anglers are raving about their “tightline nymphing” fly rods for being incredible and priced below competitors’ products. So, I reached out to them and am grateful that co-founder Mark Longmire agreed to be interviewed. Mark has been in business for a long time, sometimes working with his friend Eric Salage. Just a little a bit ago, they decided to quit their jobs and start Syndicate. Down in Knoxville, TN, one of the most exciting fly fishing companies is doing some great stuff. How did Syndicate start? What’s the mission? Well, I’ve been chasing trout since age six. Eric and I saw an opportunity within the tightline nymphing niche, which is growing, particularly among the younger demographic. Our average customer is 27 years old. Our company is only about 18 months old. Where do you want the company to be in 10 years? Money wasn’t the reason for doing this. We both had good gigs. To see the look on a kid’s face when he/she hammers a 24″ trout is great. If we can offer the right products at the right price, then money is just a side effect. We also want to attract a younger demographic into the sport. That’s critical. We want fly fishing to be open to all. Being tight-lipped about it won’t be good, if we lose the numbers and cannot influence things like conservation. Will Euro-nymphing ever be mainstream? What’s the best way for an angler to start with tightline nymphing? It’s easy. Just do it. You can easily get going right away. First, the rod’s action is very forgiving, and is very easy to perform a traditional fly cast. I think contact nymphing is also very easy to learn as compared to, say, trying to learn a double-haul cast and mending line across multiple currents. It’s easier to work with a long fly rod. What’s a good starter tightline rig? Hardware? Leader? 10′ 3 wt. fly rod. It has good backbone and can be used to throw dry flies and small streamers. It’s the new 9′ 5-wt. for tightline nymphing. I use a good low memory fluorocarbon as a tippet. I use Amnesia for the sighter. I don’t use the competition fly line, so I fish a hand-tied Spanish style leader to make a 30′ leader with a low memory mono line. It’s just more way more sensitive and doesn’t sag like even the lightest fly lines. What makes Syndicate fly rods different? We went to the competitive anglers and got their feedback on how to build a great fly rod. We tried to be humble and listen. We price our gear affordably. We’re at $299 to $325 at retail vs. $800+ for other Euro fly rods. I then worked with our lead engineer and his team to translate angler speak into the math and science required to make a solid stick. We started by looking at the top rods in the space. We wanted to build a rod that had all of the utility of the rods, make it more sensitive and then offer it at a price that would wouldn’t be so hard to live with. We’ve tried to keep it very spartan. Then, we worked with an experienced manufacturer who has done a lot of high-end rods. You should know that we can price fly rods competitively because there’s little overhead at our company. And, that’s by design. Our company meetings happen outside at a picnic table. When we’re done, we all go off and fish. We feel that modern technologies allow for much more efficient business models in a World economy. Great fly rods aren’t designed in cubicles on computers. 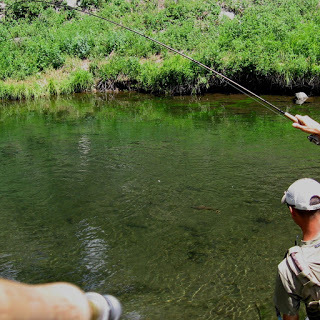 How should an angler buy one of your fly rods? If they’re a competitive angler or a guide, there’s a pro deal that you can get by filling out some paperwork (here). If you’re not, you can contact one of our retailers. We’re not yet in New England. We’re trying to keep growth controllable. You also can buy a fly rod at Amazon. We want people to support our fly shops first and foremost. We feel the retail shops are still very important within the industry. Anything else people should know about the company? Eric and I both try to be accessible. One of the rules we came up with when we got started was this: we decided to be accessible and helpful. So, we are present at many events and we listen closely to product feedback. We love this. We love making fly fishing affordable and accessible to all, particularly younger folks. That’s good for the industry and good for all of us, if we can get more people coming into this sport. Regardless of your politics, issues like water conservation affect all of us. We are all connected. It truly is one big Syndicate. Eric emailed me to say that he’s going to lend to me some demo fly rods. So, I’ll try them out and will do a Gear Review post. I must say that you guys are doing a great job with this Blog. I have to say that having a second writer really helps. Also, Adam is clearly an incredible angler and extremely knowledgeable. I'm learning a ton from him! Great interview! Learned a lot!